We may have seen examples from Telerik where they had exported data to CSV but Column Headers and Column Values are assigned manually to StreamWriter object. For this post we will improve further on that by doing it dynamically, which makes sense when you are generating your grid in dynamic fashion as well. This is good as it saves you time as you will not hard code all of the Columns you need as well as giving that flexibility later when you want to add or remove items from the Gird View without doing some code changes, this will also gives you the option to save user preferences. First lets assume you have a grid, dynamic or not but in this example I am generating my columns dynamically. Normally it would look like this for dynamic column generation. 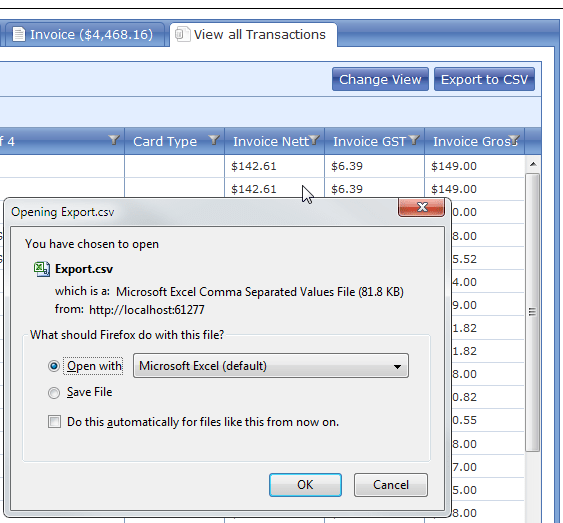 Now go to your controller then add the following Action for exporting your csv.